We’ve been busy Little Folks down at our Head Office in Wiltshire, dreaming (and creating) big statements for our product imagery for this season. One of our key focuses of late has been to provide our Little Folks Tribe with tonnes of inspiration to inject pizazz and personality in to your little ones’ rooms. 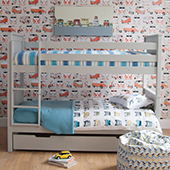 We understand the challenges when it comes to decorating children’s rooms, and the need to create spaces that will inspire their imaginations for years to come… Boring rooms begone! So, first thing’s first. Let’s talk wall art. On a BIG scale. 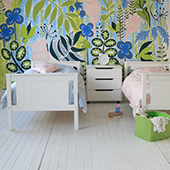 Currently at the forefront of Interior Design trends, must-have murals have brought an amazingly punchy dynamic to rooms, and in particular, to children’s bedroom spaces. They’re fun to do, a great excuse for a collaborative effort involving the whole family (just make sure you’ve got a few of ‘dad’s old shirts’ to hand for your mini Picasso), and can be fully personalised to the child, which we think is absolutely wonderful in a world where we’re on a mission to empower the next generation with confidence in their decisions. - Quite frankly, what’s not to love about creating bold, expressive artwork? However, it would be remiss of us not to mention the downsides of mural-ing, though with everything, there’s always a solution… Firstly, changing minds can be problematic (but if like us you’re a mural-addict, then that’s no hardship unless you’re attempting to switch from a kingdom of fairies to a barrage of pirates, of course), or maybe you love the idea but lack the confidence on how to make it a reality? If you’re still with us, I’m assuming that you’re the kind of parent who loves an arty challenge… So, where on earth do you start? Luckily, we’ve have been embracing the concept of bold and beautiful statement walls in all of our latest looks for this season. Check out some of our favourite new product shots in the below inspiration gallery. - We’d love to hear what you think! 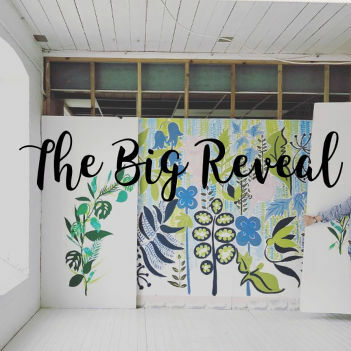 If you love these looks and want to be in the know on how to recreate the art work for yourselves, hop on over to our other articles, where Fi from The Cubby Hole talks through the process behind our latest creative collaborations. 1. Tropical Vibes are sending us barmy for botanicals! Featured product: Frooti cabin bed in Lime. 2. If an English Country Garden is more your cup of tea, check out this high impact botanical beauty. Featured product: Classic beech bunk. 3. Magical Monochrome the one the one for you? Give simple geometric shapes a try! 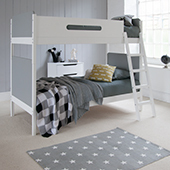 Featured product: Simple bunk in grey. 4. An oldie, but a goodie. We still love a good mountainscape here at Little Folks! 5. For a smaller scale colour pop, add some bold painterly dashes to brighten their space. Featured product: Simple bed in white.